The assorted ramblings, photo essays and work of a British born , classically trained, Japanese Metalwork artist living in Torquay, England. Or more accurately the tiger! My journey into the exacting world of Classical Japanese decorative metalwork, or Kinko in Japanese, (so much more concise a word) has been a long and exciting one. I’ve been blessed, it seems, by a series of opportunities that came about with the help and support of a wide range of individuals who have entered my life. At some point I will need to write an account of those peoples impact on my life and career, and my ambition to get to where I am now …but that will be a very long essay and not what I want to tell you about now. About 2 years ago Bob Morrison first contacted me via the Nihonto message Board about some of my tsuba that I was offering for sale. Since than Bob has acquired a few more, including my most recent tsuba. The one the with tiny gold orchids. It’s safe to say that he’s the holder of the largest collection of my work, something I’m obviously very grateful for because without this sort of patronage I’d be unable to continue doing what I do. The number of people who do this sort of work professionally can be counted on the fingers of one hand, or should that be finger?, and I often feel like an endangered species, so Bob’s commitment means more than just being able to pay the rent. I know he’ll be embarrassed by me saying this but it needs to be said, I’m touched and extremely grateful he sees something worth investing in, and supporting, in my quest to find what the masters of the past were seeking, to grasp something of that past glory and to attempt to express myself authentically through this medium. 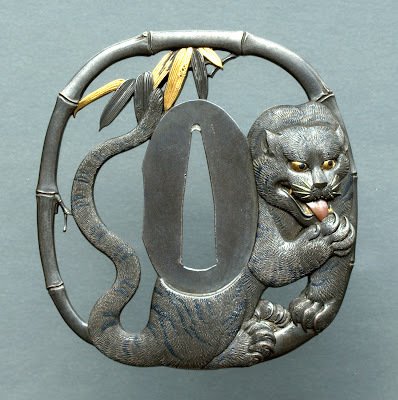 Earlier this year Bob raised the possibility of me recreating a missing tsuba, the larger companion to a wakizashi guard he owns. I’d commented on the extant piece when he posted some images of it on the NMB a couple of years ago. I was struck, at the time, by the very evident design accomplishment and, from what I could see, the very high standard of workmanship. I was confidant that it was no generic work but had come from the hands of a real artist. A month ago Bob and I begun seriously discussing this project and the possibility of photographically documenting the making so that it could be presented as a slide show with a commentary of sorts by myself. I then got a little excited and over enthusiastic and suggested that I might be able to get some short bits of film as well, if I could only get hold of a decent camcorder…and that was when things took on a life of their own. A few days after Bob and my conversation another friend of mine, a kinetic sculptor by the name of Justin Fiske, called to ask if he could bring a blacksmith friend of his, Conrad Hicks, over for a studio visit. Always happy to meet other mad, creative types…especially metal bashers, they popped in for a cuppa on the Wednesday. In the course of our wide ranging and rambling conversation I asked Justin, almost as an after thought, if he didn’t know where I might hire a decent high definition film camera for a couple of months. He responded by suggesting that I contact a good friend of his, Brad Schaffer, who’s a film maker and had in fact done the videos on Justin’s own website. After a lengthy , and animated, phone conversation the next day, Brad and I met in my studio on Friday. By the time heleft a few hours later we had fleshed out a documentary film and the handling of the subject…me and the tsuba!. The minor sticking point in our scheme was, as it always is, the financing. That Friday evening I spoke with Bob again and filled him in on what had developed during the week and how we’d suddenly gone from a slide show to the possibility of a full blown, professionally produced documentary. I’d discussed with Brad the possibility of obtaining some funding to at least cover the initial production costs but as Bob and I spoke we came to the conclusion that to keep the project going in the direction we envisaged it needed to be kept free of outside vested interests. At the end of that conversation Bob had decided to become a partner in a film production. Partly, I suspect, encouraged by thoughts of brushing shoulders with lovely starlets at Canne Film Festival. Me being in Cape Town and Bob in the Midlands of England did leave him a bit out of the loop in terms of the discussions that would need to follow though so Bob decided to deliver the little star of our show himself. The following Thursday evening I had to miss the final dress rehearsal of Madame Butterfly ( I wasn’t singing in it…just in case you thought I was... ) to collect Bob from the airport and next morning we met with Brad and his producer, Richard, and went over the details of the project in detail. Clearly they’d done this sort of thing before and things came together somewhat seamlessly . We dotted all the “I’s” and crossed all the “t’s”…and we now have a film in the making thanks to Bob’s willingness to cover the initial filming costs. We agreed that the subject would yield 2 films. 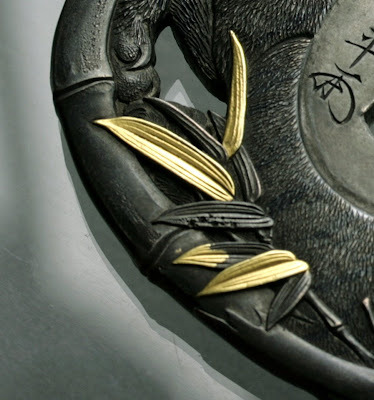 The first, in some ways the simpler project, will be a fairly straightforward documentary account that will follow me as I analyse and investigate the tsuba we have as I recreate the alloy and work though the many exacting and complex stages of the making of an exact a copy of the missing tsuba possible. We estimate that filming will yield around 20 hours of footage so we’re pretty confidant this will be an exhaustive and detailed visual record. I’ve also committed to withholding nothing in terms of technique or process. 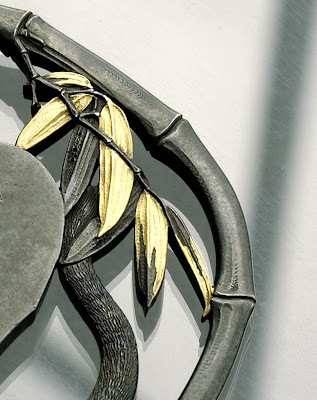 My intention is to reveal as much as we can about the making of work like this and I think that due to the complexity of the actual tsuba and it’s sophistication this film may in fact be a very thorough introduction to kinko tsuba making. By the time he got back on a plane to return home on Sunday evening Bob and I’d spent 3 evenings talking to the early hours and really getting to know one another. I’ve also spent a lot of time with Brad in the last 2 weeks and he and I are also getting to know one another very well. So at this stage I feel very fortunate to have such understanding support in this project because I have a feeling that one day I’ll look back on this and realise what a perspective changing opportunity this actually is. Now I need to calm my nerves and ignore those nagging doubts in the back of my head and simply get on with what I’ve spent all my working life preparing for. Before Bob left we spent a few hours working out what we could based on the only image we have of the missing tsuba. We’ve tried to be as thorough as possible and when things settle into a less hectic work pattern I’ll do a blog entry detailing exactly how we reached our conclusions about size and what the back may have looked like. This week I’ve been refining the working drawings and developing a shibuichi alloy to match the colour and grain structure of the existing tsuba. It’s proving to be a more intuitive task than a purely scientific analysis would suggest. This evening I’ll be casting a trail ingot (based on my experimentations so far), it’ll be pored into boiling water just as it would have been done in the past and as it’s such a visually interesting spectacle we’ll do it again tomorrow evening in front of the camera. I have to get a bit of a rehearsal in beforehand because if I make a mess of it on film I know you’d never let me live it down. These are some images of our little tiger, with some detail shots. It’s those details in fact that are quite literally Hagia Katsuhira’s fingerprints. I’ll elaborate at a later stage on these features and what they tell us about this artists approach to his work…it’s very exciting and I think may reveal something quite special. The tsuba is very delicate and measures only 70mm top to bottom. The one I will be making will be 74mm high. 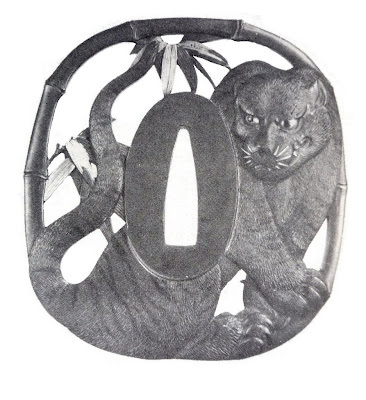 The black and white image is the only record we have of the missing tsuba. I'm a Classically trained artist metalworker. My initial training was as a Goldsmith in the European tradition. I served a 5 year apprenticeship and subsequently travelled to Japan to research the Japanese decorative metal working tradition associated with the Japanese Sword. I now work almost exclusively out of my adopted tradition. John Pilger Archives - if you want to read the "other" news. My online photo album of work, new & old as well as some images showing how it's all done.